NYPD officer Rafael Ramos, shot to death last week with his partner in their patrol car, was remembered as a selfless man of faith while being mourned by thousands of officers from across the country attending in solidarity. The services were held Saturday at the Christ Tabernacle Church in Queens, where a giant holiday wreath rested above its entrance. Ramos, a 40-year-old married father of two, was studying to become a pastor at the church and kept Bible study books in his locker, his commanding officer said. The mayor said hearts citywide were aching after the Dec. 20 shootings that left Ramos and his partner, Wenjian Liu, dead. "Officer Rafael Ramos was a man so filled with commitment, faith, belief," said de Blasio. "You can see in his family. You can see what kind of parent he was, what kind of husband he was, what kind of son he was - what it meant to his family. Because a family so strong is a result of that kind of love and commitment." Ramo loved playing basketball with his sons in Highland Park, watching the Mets, and blasting Spanish gospel music from his car, the mayor said. De Blasio followed Vice President Joe Biden and Gov. Andrew Cuomo on the roster of speakers eulogizing Ramos on Saturday. "When an assassin's bullet targeted two officers, it targeted this city and it touched the soul of an entire nation," the vice president said. Officers inside and outside the church applauded when Biden called the New York Police Department the finest in the world. "You all joined for essentially the same reason," he said. "There was something about you that made you think you could help, that you should serve, that you had a duty." He added, "To the Ramos family, we were all lucky to have Rafael. He didn't just have a Bible in his locker, he lived it in his heart. He was a cop for all the right reasons." Cuomo called the daylight shootings of the officers as they sat in their cruiser on a street in Brooklyn's Bedford-Stuyvesant section "an attack on all of us." The governor nevertheless managed to bring some warmth through gentle jokes about the Ramos boys' favorite sports team. "Justin and Jaden are Mets fans, which shows they are truly loyal," he said to laughter inside the church. He went on to tell the officer's sons: "You have represented yourself with pride and dignity." A particularly poignant moment came when Police Commissioner Bill Bratton said he was making Ramos a posthumous NYPD chaplain, and promoting him and Liu to first-grade detective. The announcement drew long applause from mourners at the service and officers outside the church. Bratton said Ramos was admired by his fellow officers. "He came on the job older, a family man, street smart," he said. "He knew how to handle people, and the younger guys looked up to him. He never shirked a task, and he never complained." Ramos entered the police academy at 37, and Bratton recalled from his conversation with Ramos' widow, "he'd come home pretty tired, competing with all those younger recruits." "But he passed with flying colors, wearing the gold braid for being in the top of his class, no small feat," said Bratton. When the Ramos family arrived at the church earlier, the eldest son — wearing his father's NYPD jacket — was hugged by a police officer. Family members didn't speak at the funeral but during an eight-hour wake Friday, Justin Ramos described his father as a selfless, caring and compassionate man. "What happened to my father was a tragedy," he said in a tearful eulogy viewed by hundreds of officers in the street who watched on giant television screens outside the crowded church. "But his death will not be in vain." After the service, an emotional ceremony was held outside the church, first with a helicopter flyover and then a procession. Police pallbearers carried the flag-draped casket of Rafael Ramos out of the church, where a motorcade led by more than 150 police motorcycles led the way south towards Cypress Hills Cemetery. Men in uniform from all five boroughs and across the nation walked right behind them. Services for Liu will be held at a funeral home next Saturday in Brooklyn. Officer Dustin Lindaman of the Waterloo Police Department flew from Iowa to attend Ramos' funeral. "He's one of our brothers, and when this happens, it affects everyone in law enforcement — it absolutely affects everyone," he said. "We wanted to show our support." Lindaman was among the tens of thousands of officers lined outside the church. Some veteran officers said the sea of blue was the biggest they'd ever seen for a police funeral. "The thought of the family loss around this time of the year has to be terrible, it's the holiday season," said officer George Roa of the Suffolk Police Department. "We feel for them. We're here to support them." Neighbors, too, turned out to watch. Kathy Urbano lives near the procession route and described the outpouring of support as "amazing." "Just wish it were a better situation and that things progress positively in the future for us all as a city," she said. Dawn Wegard of Old Bethpage on Long Island said, "Police have an important job and we're here to support them and may we never see something like this in our life time again. God bless the police officers." Some of the officers outside the church turned their backs as de Blasio spoke. Police union officials have said the mayor contributed to a climate of mistrust that contributed to the killings of the NYPD officers. In online posts shortly before the attack, Brinsley referenced the killings of two unarmed black men — Michael Brown in Ferguson, Missouri, and Eric Garner on Staten Island — by white police officers. 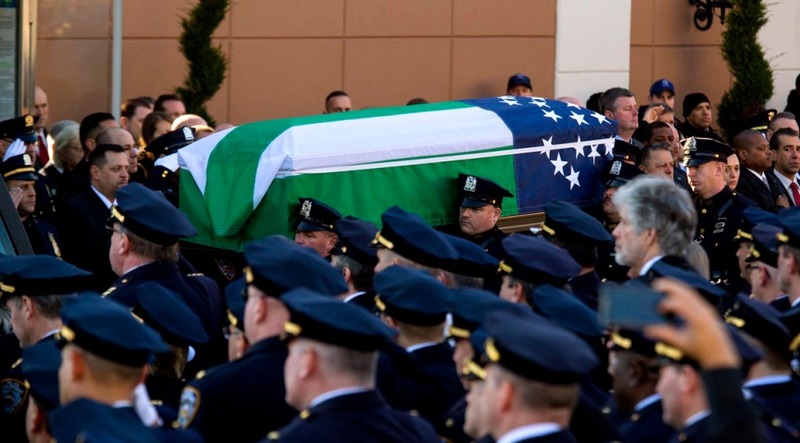 Ramos and Liu were the first officers to die in the line of duty in New York since 2011.